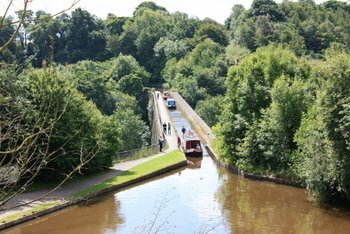 Chirk Aqueduct- A canal boat holidays attraction. 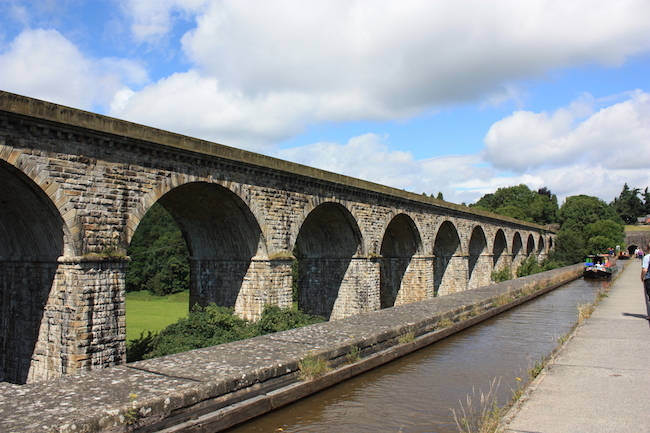 Chirk aqueduct carries the Llangollen canal over the River Ceiriog on the English/Welsh border. The cast iron through carries the water on masonary walls. The water level is 65 fee (20m) above the river. The Chirk Viaduct also runs alongside the Aqueduct. Upon navigating over the aqueduct towards Wales, the Chirk tunnel is next (seen in the distance of the image above). The aqueduct consists of ten arches, each with a span of 40 feet (12 m). The water level is 65 feet (20 m) above the ground and 70 feet (21 m) above the River Ceiriog.